I've been truck camping, travelling, and back road travelling in various mechanical proclivities for many years. Never really put a name to it, nor had the time or want to. Well I am getting older and realizing my current career includes a form of "overland travel" and folks may find it interesting. I am a Construction Manager on National Park Service projects. I have been working in various places, including the Chesapeake and Ohio Canal National Historical Park, Yosemite National Park, and currently the Blue Ridge Parkway. Follows will be a few photos and descriptions of work life. I am NOT camping often at all. With my workload I do need proper lodging as sites are typically not accommodating for office work, Wi-Fi, etc.. But I am travelling "overland" so to speak and it will be likely future Parks will require more rustic accommodations that I look forward too. Currently steering a 2017 Ford C-Max SE Energi. Getting around 52MPG and running Uni-Royal Tiger Paw Ice and Snow 3 in 225/50R17s on Sparco Terra Light Gray 17" wheels for that rally look. I bought this car for my original commute in DC for a project on the C and O Canal, now paid for I figure it must earn its keep even during inclement weather. I am very happy with this set-up and it has worked well during sleet, ice, and snow on the un- maintained Parkway, using common sense and a light pedal I am very confident in this car on icy and snow covered surfaces up to 8-10"s when powdery. We also brought my wife's 2016 Ford F350 for those sites where "Mad Max" could not make it due to ground clearance issues or heavy mud. I'm interested in what kind of work you're doing on the BRP and where (more or less). 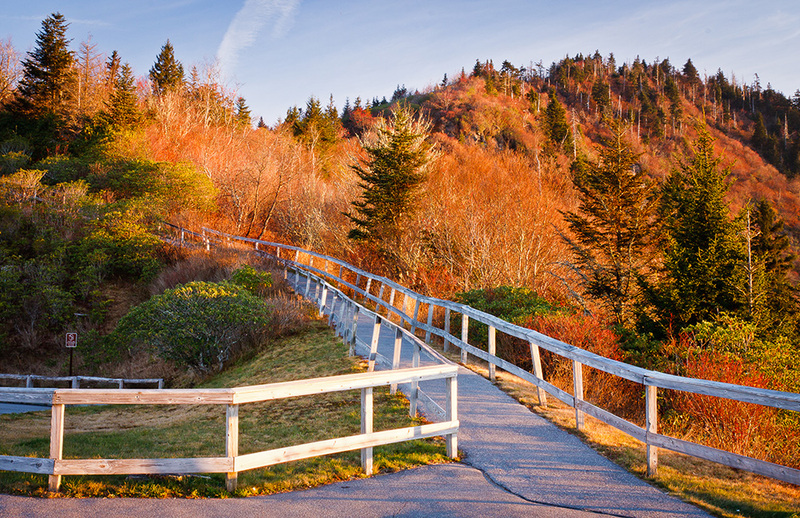 We have a vacation home near the BRP at Blowing Rock and get up there from our Raleigh home regularly. That's very interesting, we are in Blowing Rock, NC right now! This is a beautification project in which we demolish and remove excess structures and return the properties to natural contours and conditions. There are 56 structures on this contract from Blowing Rock, NC and North to Peaks of Otter, VA. I'm very close to the Peaks of Otter in VA and I spend quite a bit of time on the parkway. Thanks for your hard work at keeping it beautiful! What a great spot to call home!! I will be back up there soon and hope to get to Bedford, VA and visit Blue Ridge Overland Gear!! Thank you for your support, I am really blessed to be involved in such a career on our Nations public lands. So I suppose many (most?) of the structures being removed are off of NPS property but in line of sight of the BRP, and being removed with the cooperation of the private property owners? Would you happen to know of any broad plans to "top" or remove trees at some of the overlooks? Some of the overlooks no longer overlook anything because the trees haven gotten so tall as to block the view. Actually all of the sites we are demolishing are on Federal lands, and more or less in view from the Parkway. We do notify and work with adjacent property owners frequently due to access and right of way concerns. Most of the sites are not directly accessible from the Parkway but from state or private roadways skirting the Parkway. I do not know of any plans to clear the many overlooks that have become overgrown. I agree it is frustrating at best. Could get political very quickly but I won't . Best. Cool job you have. I am in Richmond and go to Peaks of Otter quite a bit for brookie fishing/camping/exploring. Spotted this Iveco resting at an overlook near Blowing Rock, NC this morning. I would have stopped to chat but didn't see any movement. Was this anyone involved in this site? Also found a decent shed on the mountain near Cascade Falls. That time of year!! Camp Catawba, gone. Site restoration in progress. (personal business). What an amazing view of "The Peak" 5000ft. Yesterday evenings ride put us at Linn Cove Viaduct in a minor snow squall. Made an amazing loop Sunday during perfect weather. Looking forward to going back to explore the area a lot more (trout fishing). Left the place here in Blowing Rock and immediately dropped off the mountain onto Globe Road, followed down the infamous no pedal MB route to 90, making a right here, followed 90 to Brown Mountain Beach Road. We got out and went for a few short hikes, and a little bouldering and exploring Wilson Creek (Wild and Scenic River) along the way. Came to 181 and climbed the mountain to FR 464 and then a left onto FR 45. A fantastic loop, and cannot wait to go back and take our time fishing and exploring this area of the Pisgah more deeply. Brown Mountain view off of 181. Wilson Creek, amazing clean water. My son, trail buddy, and best friend, doing some bouldering! Hi MLEmaster, I'm coming to NC in a month and will have 5 days on the parkway coming from Wilkesboro to Ashville. Do you have any particular recommendations for day hikes or camp sites (light 2 man tent) from your experience. I have seen, but am yet to properly read the NPS trails website so any quick pointers would be super. I'm really a novice in this area but there is no shortage of great hiking opportunities. I am not tent camping right now and I am not familiar with any "open" campgrounds on the Parkway at this time. I would look to adjacent National Forests and NC State Parks where camping is readily available. I will mention a few but I am not certain of the availability. Camping- Stone Mountain SP a little North of Wilkesboro, and Pisgah NF, lots of dispersed camping available off of the Parkway from Wilkesboro to Asheville. Short day hikes we have done are Elk Knob, Three Top Mountain, Price Lake, Grandfather Mountain, Linville Falls, Lost Cove Trail, Mount Mitchell is a must see as well, and a few more that may come to me later. I've spent most of my time here in the SW Virginia area and I am relatively new to WNC area but its amazing here with NO shortage of outdoor adventures. Using the All Trails App is a great way to plan out your adventure along the way. Enjoy your 5- days here and be safe! Parkway is closed in a few spots as well still, just South of Cumberland Knob is closed for a portion and just South of Mount Mitchell, NPS has a great live map showing closures on the BRP website, this will help in planning too. Here is link to a good article, covers more than what you are looking for but just showed up in my Google feed. The Cascade Falls trail is another that I did and recommend for a quick hike.